Several taxi firms plan to raise fares after gasoline prices were hiked by around 11% on May 5. Vietnam's credit growth rate reached 2.78 percent in the first four months this year – the highest in three years, according to the National Finance Supervision Council (NFSC). Vietnam continued reducing import taxes on oil products, beginning April 4, according to the Ministry of Finance. Since May 1, there will be an increase in environmental taxes on oil and gas products that take it three times higher than the current levels. 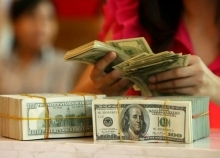 Economic experts have suggested the State Bank of Vietnam (SBV) adopt a flexible foreign exchange policy and adjust it based on supply and demand, instead of forcing the Vietnam dong-US dollar exchange rate to move within 2% a year. Business performance at banks is expected to improve significantly during the second quarter, against the same period last year, a State Bank of Vietnam (SBV) survey said. (VEN) - The Ministry of Finance recently issued Circular 46/2015/TT-BTC stipulating the collection, management and use of tra fish assessment fees. The circular requires organizations and individuals which export tra fish to pay these fees (VND100,000 per export contract per assessment - this already includes the value added tax). Vietnam International Bank (VIB) has been honoured by Global Banking and Finance Review as the “Best Banking Deal Vietnam 2015” and “Fastest Growing Retail Bank in Vietnam 2015”. Experts have urged the central bank to apply the crawling peg - an exchange rate regime that allows depreciation or appreciation to happen gradually - to help firms develop appropriate business plans.